Law is for those who are interested in creating real change in our society. Law professionals advocate for systemic change which has the potential to transform the lives of many. A law degree is one of the most versatile university qualifications available. As part of a law degree, you can specialise in a range of areas including commercial, private, constitutional, criminal, civil and human rights law. There is also the option to study how to work with people and analyse the legal system, criminals and crime. Why study law at UON? Join Australia’s premier clinical law school with opportunities to work with practising lawyers on real cases through our Newcastle Legal Centre. Become a lawyer sooner with the required practical experience to be admitted to the bar. This gives you a kick start to your career and puts you at least 6 months ahead of other graduates in a similar position. 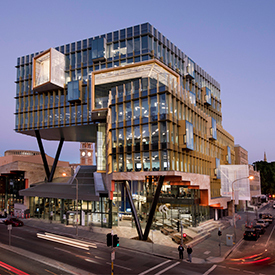 Study in NeW Space, our new $95 million facility in Newcastle business district, right next to the Newcastle Law Courts. Experience new-age learning and a strong community of practice. Connect with industry through practical placements, guest lectures and industry visits. This is why our graduates enjoy a 92% employment rate in both practising and non-practising legal roles. Video: Elise is pursuing law to be a voice for justice and equality. If you have an interest in Aboriginal issues and want to advocate for this group you could focus your legal studies in this area. You will learn about the social, political and justice issues impacting the Aboriginal community. Working closely with Aboriginal clients you will touch on various fields of law including Aboriginal law, human rights law and constitutional law. You do not necessarily have to be a lawyer and could focus your specialist knowledge in a range of roles helping the Indigenous community. Focusing your law degree alongside arts and humanities allows you to understand issues within a wider context. An understanding of how society functions will allow you to advise and advocate for a range of different groups on a range of issues. Your studies will enhance your understanding of society and humanity and could see you focus on criminal law, family law, social justice, anti-discrimination, copyright or human rights. You are also well placed to operate in government, political or diplomatic environments. Tackle the world’s most complex challenges and be an in-demand professional with a focus on business and law. Specialists in this area understand Australian and global legal systems but also have a deep understanding of companies including operating structures; financial systems; governance frameworks; employment and staff awards; and legislative environments. You could work in various fields of law relating to companies including corporate law, contract law, employment law, workplace health and safety, taxation law and commercial law. Crime cuts across all facets of society. Students focusing their degree on this area defend, prosecute and attempt to understand the people involved in crime. Criminal lawyers deal with simple criminal cases like parking fines to more complex charges such as murder. They can either represent the accused or work for the Crown Prosecutor. Criminologists on the other hand explore the social causes and consequences of crime, deviance, and criminal justice issues. Students specialising in this area are not trained as law professionals, but in the investigation of social responses to crime and crime prevention, including organised crime, online crime, terrorism and violence. Criminology specialists are employed all over the world and operate in interesting roles tackling inequality, sustainability and conflict. Communication and media law encompasses all legal issues affecting the media and telecommunications industries. Your study will focus on issues including free speech, defamation, copyright and censorship. Communications and media law used to historically affect journalists and publishers, however with the advent of the internet, blogs and social media, everyday people are just as likely to face similar legal complications. Communication and media legal professionals operate within organisations or as advisers to individuals and companies. It is becoming increasingly easy for individuals to set up small businesses and get innovative ideas off the ground. Students focusing their studies on this area will learn various aspects of law including copyright, intellectual property, trademarks and patent law. You may want to use the skills and legal knowledge you gain in your degree to navigate the regulations and requirements of starting your own business. You might also use your degree qualifications and know-how to specialise as a legal professional in the area. The world is becoming more global and the interplay of countries through trade agreements, treaties, foreign investment and governing bodies is becoming increasingly more common. Students in this field will develop a global outlook and a strong understanding of international laws surrounding economics, social justice and politics. With this background, there are opportunities to make a real difference in the areas of development, poverty and inequality. Many industries need graduates who can understand and translate complex science—and law is one of these. With the growth in scientific research and the commercialisation of new technologies, professionals with knowledge in both science and law are increasingly sought after. At the same time, with growing awareness of the importance of environmental sustainability, science/law professionals are required to work on regulation and legislation surrounding environmental protection. All law degrees at UON are offered as a combined program. This means you broaden your knowledge and get two degrees in only five years of study. No matter if you want to be a practising lawyer or are interested in pursuing something else, a strong legal understanding and the ability to apply logical reasoning means that law graduates are extremely competitive for employment opportunities in a range of sectors. Bachelor of Aboriginal Professional Practice: You will develop an understanding of the social, political and justice issues impacting the Aboriginal community and learn how to communicate effectively with Aboriginal clients. Bachelor of Arts: Broaden your understanding of legal issues by seeing them within a wider context choosing, for example, Arts with a History major. This combination will complement your legal knowledge with an understanding of how society functions. Bachelor of Business: A combination of Laws with Business ensures you will have specialist in-depth legal knowledge, but also possess a strong understanding of business affairs. This is a valued and useful asset for a career such as an in-house lawyer. Bachelor of Commerce: If numbers stimulate you, a law degree combined with Commerce will improve your understanding of important legislation that is relevant to economics, finance and accounting. Bachelor of Communication: Some of the most powerful and influential forces within our society are the mass media and communication technology. Be on the forefront of constantly developing laws and regulations. Bachelor of Innovation and Entrepreneurship: This combination is for people who are interested in turning big ideas into new ventures, with the added understanding of the surrounding legal environment. Bachelor of Development Studies: Development Studies focuses on key global issues in a local, national or international context. By combining this degree with law you will be able to advocate for change and make a real difference in issues like development, poverty and inequality. Bachelor of Science: The Bachelor of Science combination will enable you to apply your scientific knowledge to a range of legal contexts including industry, agriculture and the information revolution. Bachelor of Social Science: The Bachelor of Social Science combination is ideal if you are interested in improving social justice, anti-discrimination and human rights. Emily talks about her experience studying a Bachelor of Laws (Honours) combined with a Bachelor of Arts at UON. Learn more about the various aspects of law with Margo and Josh. Law on the Beach is a free legal advice clinic staffed by Newcastle law students and Legal Centre lawyers in January and February annually. Learn more about UNLC, a community legal service and a teaching facility for law students.